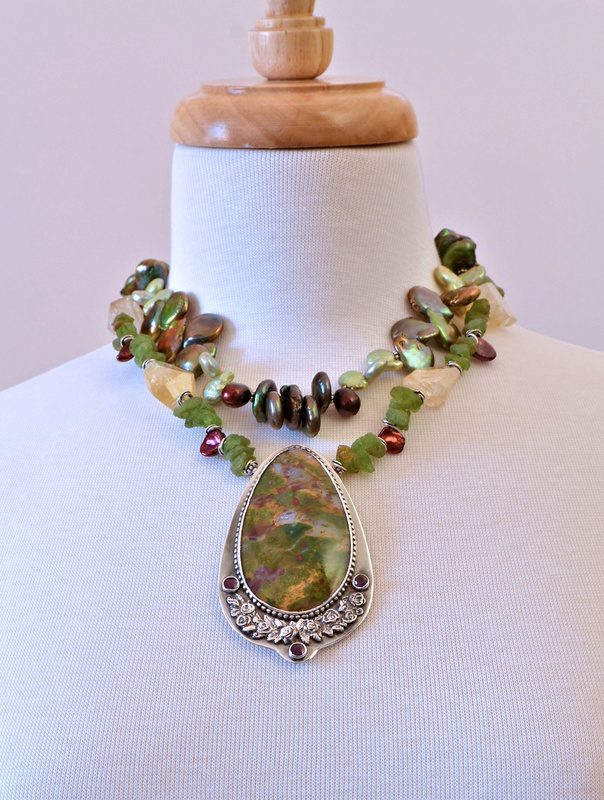 Hall says the terms Heliotrope and Bloodstone are often conflated and that there is a distinction with Heliotrope being translucent and Bloodstone opaque. However most references do not make that distinction. 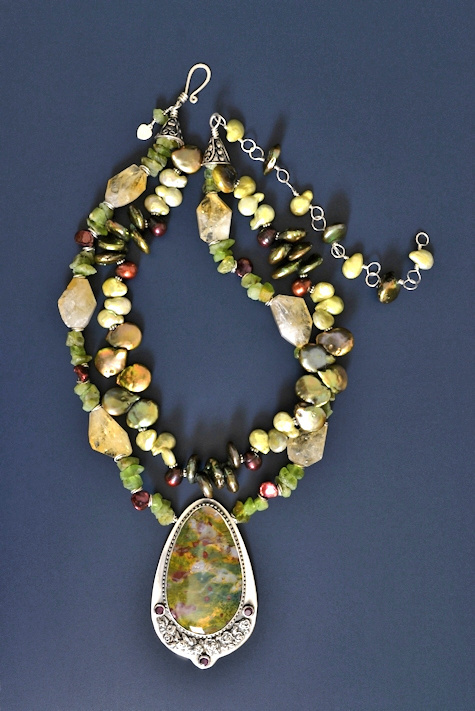 The stone in this piece is partially translucent so it qualifies for the title Heliotrope, however Gary's invoice calls it Bloodstone. We talked at length about this stone and its ability to confer invisibility in relation to my Heliotrope Earrings. (Someday perhaps I'll write about the jacket I made that did seem to confer invisibility!) 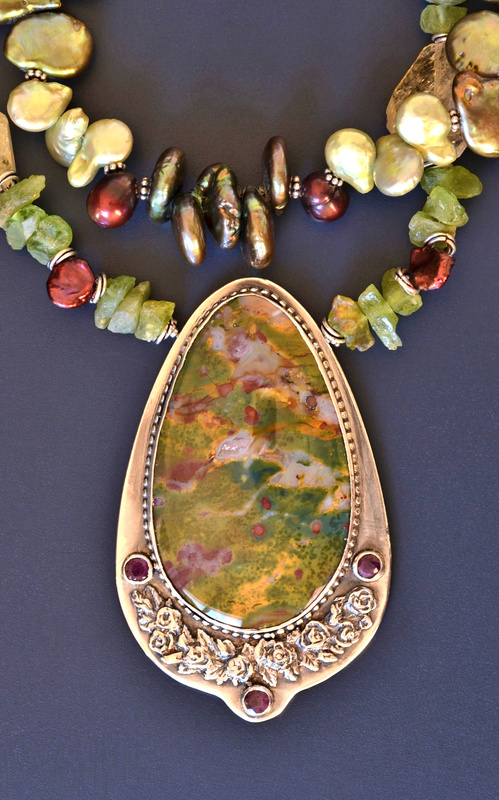 At any rate, Zenz notes that "contrary to many other cryptocrystalline quartzes (agate, jasper, chalcedony), this term [Heliotrope or Bloodstone] has always meant the same stone since the period of the classical Greece." It is mentioned in glowing terms in the Leyden papyrus (~250 A.D.). The little faceted Rubies around the cabochon are a good color match for the ruby colors in the stone so I purchased some beautiful rough Ruby beads certain they would be perfect for the composition! Alas, not so. 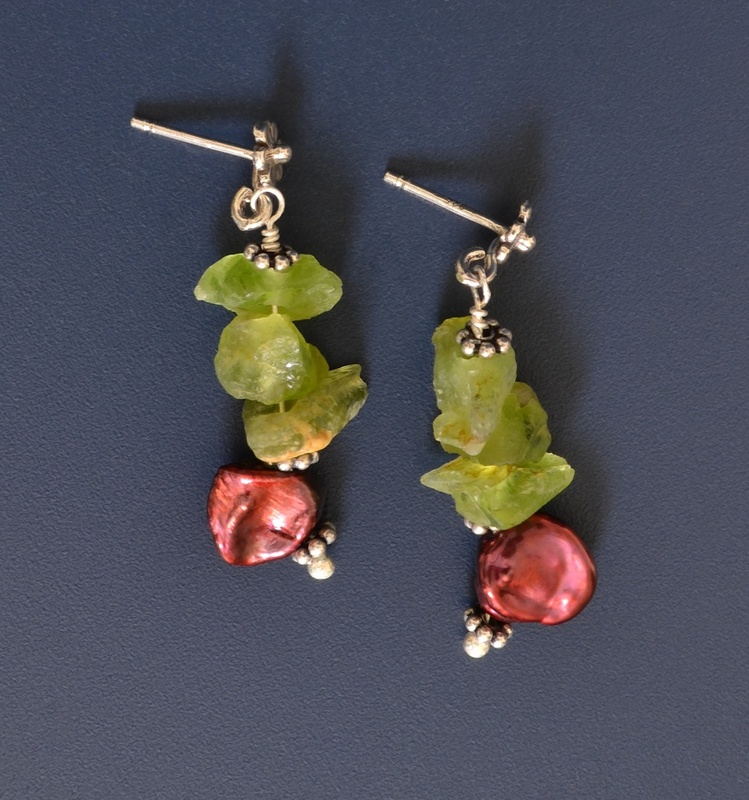 The rough Peridot nuggets and large faceted Citrines were a much happier choice with a few ruby pearls to add color. Hall (below) mentions that Bloodstone protects the soul on many levels. Melody says the message in the stone is "be here now." Ahsian mentions courage. Simmons adds that Peridots are "little green nuggets of positive power." Ahsian mentions that Ruby is a traditional prosperity stone. Melody says Ruby encourages one to follow bliss. There is so much more to each of these stones, perhaps the taste here will encourage you to explore their metaphysical properties further. Whether you have an interest in the supposed energetic qualities of stones or simply enjoy this little garden sketch, I hope you will order this set today and bask in the sunny garden even on a cloudy day.